Our friends over at the Disney Food Blog are on the ground for the opening events - let's take a look at what they've sent over to share! 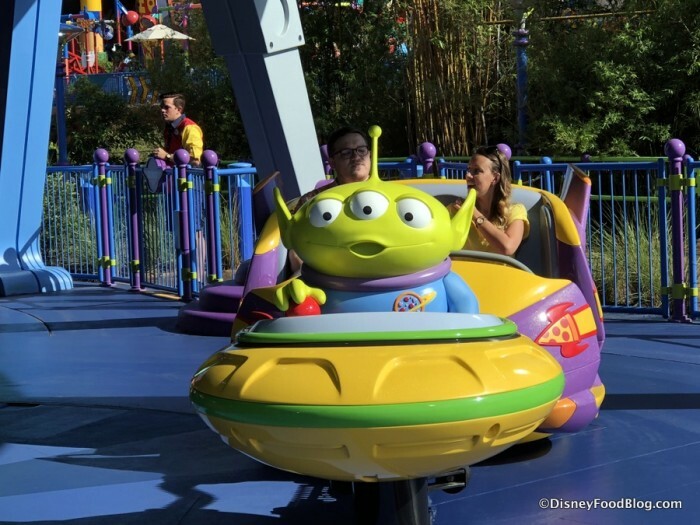 Alien Swirling Saucers is a super new attraction that's been designed to look like a toy from Pizza Planet. Aliens saucer pilots straight out of the Toy Story movies, are ready to take you for a spin in their ships. The little green guys have pointy ears, three eyes, short antennae and that expression of surprise and delight as their Master "The Claw" dangles overhead. Guests will whirl and swirl to the electronic beat in one of 22 rocket ships. Eight different Toy Story songs with a quirky new theme will have you through the Pizza Planet galaxy. Slinky Dog Dash is a family friendly coaster full of swirls, turns, dips, camelback humps, and just plain fun. 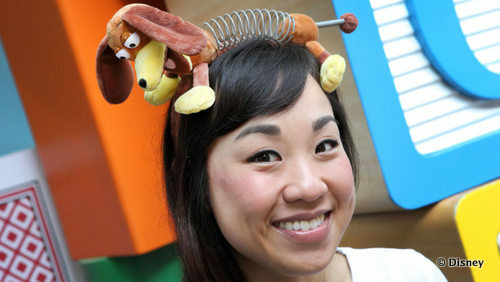 Guests can climb aboard the back of Andy's floppy-eared dachshund with the stretching coil body, Slinky Dog! During a marathon play session Andy designed a creatively tricked out coaster complete with a double launch a power booster. 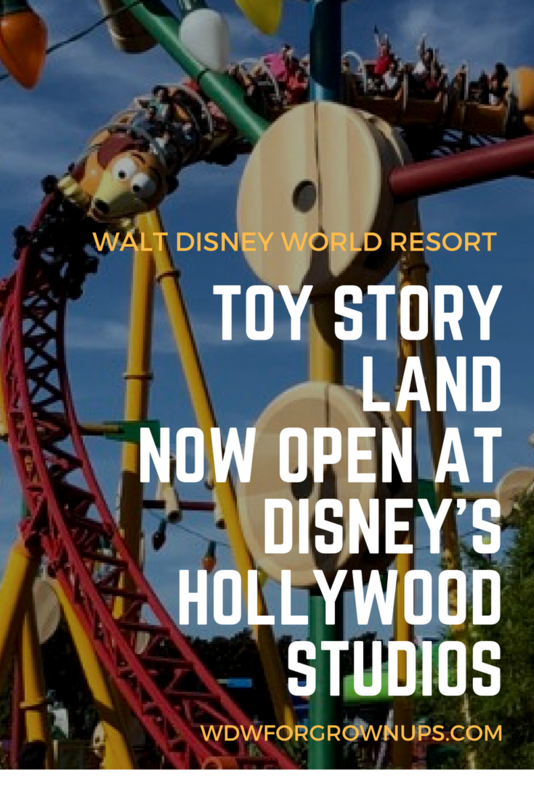 Honorary Toys will discover one hilarious scene after another as they speed around the 11 acre Toy Story Land. 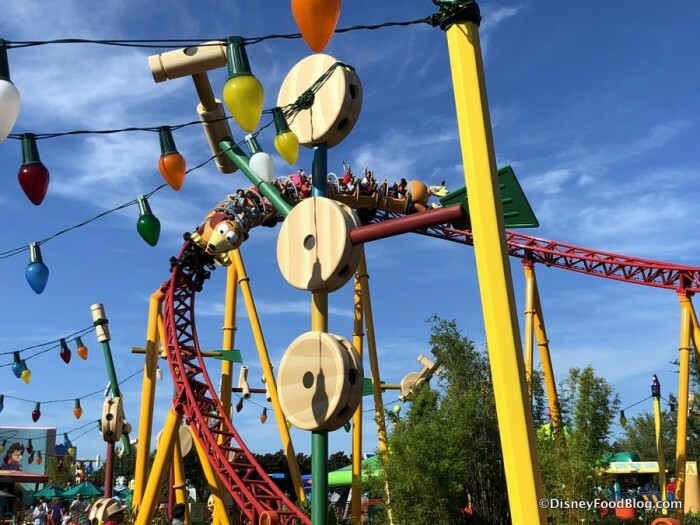 Slinky Dog Dash hits its midway point, the coaster stops, reverses a few yards, then shoots through multiple rings pulsing with sounds, spinners and flashing lights to launch riders into the second act of the ride experience. As a special good-bye to the guests at the end of the new fun attraction, Wheezy the squeaky penguin will serenade guests with a jazzy rendition of "You've Got a Friend in Me." Wheezy will be accompanied in his song by Mike (the tape recorder) and Mr. Spell, who will text out some amusing commentary. Guests wandering through Andy's back yard may be lucky enough to cross paths with the Sarge and his Green Army Man Drum Corps. Marching through the land several times a day this sharp drill team plays lively percussion sets with awe-inspiring drum sequences. They also may engage you in a game of "Sarge Says" as Sarge seeks out new recruits for the Green Army Patrol. 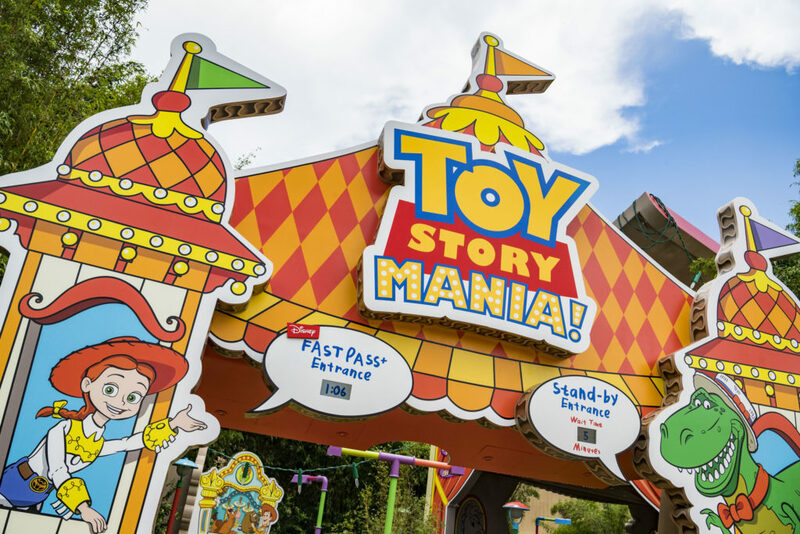 The perennially popular attraction Toy Story Mania received a third track and a brand new entry as part of the Toy Story Land expansion. The 4D attraction takes guests through five unique games, with several surprises along the way. Toy Story Mania! was laid out as a playset in Andy's room. It's full of rootin' tootin' arcade fun as guests try and take aim at moving objects in a variety of scenes based on classic carnival midway games. A New Entrance For Toy Story Mania! We took a peak at Woody's Lunch Box Breakfast menu earlier, but you can get a full overview of the treats inside Woody's Lunch Box over at The Disney Food Blog. 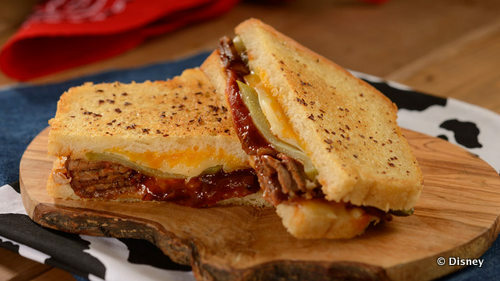 All sorts of sandwiches and sides have been reimagined to blend nostalgic comfort flavors with a bright modern twist, not to mention plenty of soda floats and specialty beverages. Head on over to the DFB for more pictures of everything wonderful to eat! Our "need to know" was mighty when it came to just how great the food would be. The menu looked good, but how did the product test out? DFB has the answer is two everything on the menu reviews! 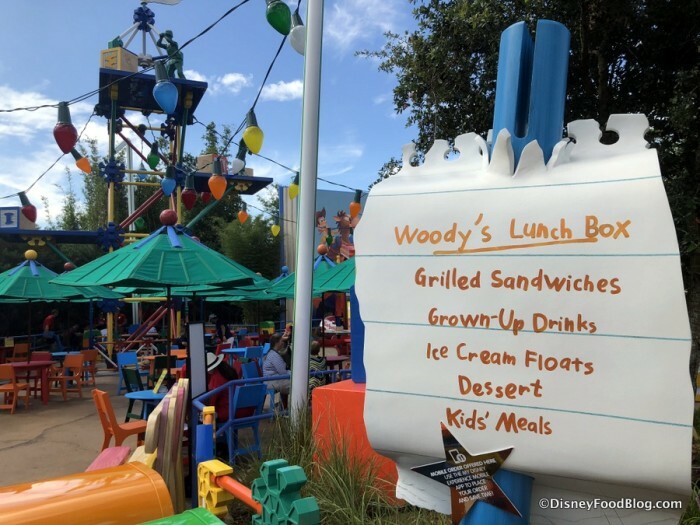 It's Time for BREAKFAST at Woody's Lunch Box in Disney World's Toy Story Land! 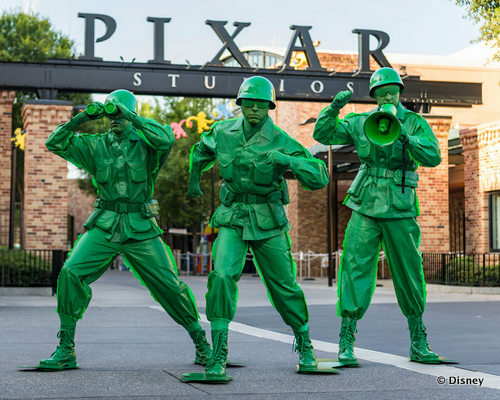 Disney's Merchandise department has stepped up so that guests can make a fashion statement in playful gear inspired by characters featured in Toy Story Land. Styles of the new land will, of course, be inspired by all of Buzz and Woody's friends. Alien-themed light-up tumblers, colorful tote bags, home decor, caps and coffee cups, bracelets and backpacks, collector pins and t-shirts " all will celebrate the new land. My favorite find so far is the Slinky Dog headband. 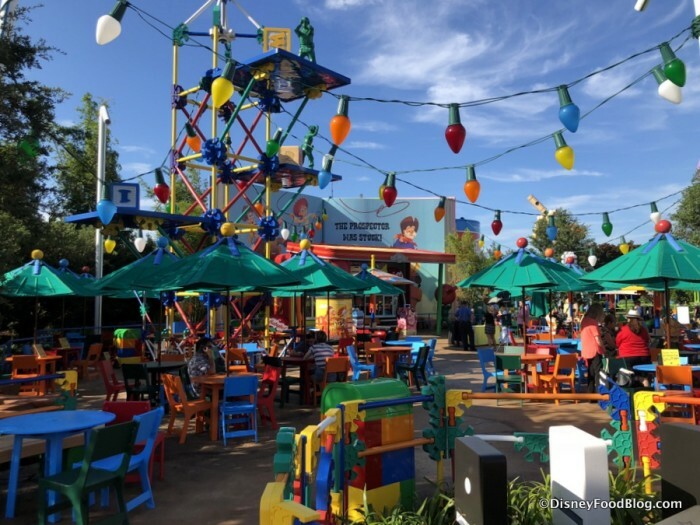 Be sure to follow all the exciting news coming out of the Toy Story Land opening this weekend from our friends over at the Disney Food Blog! Our thanks to them for allowing us exclusive sharing of all the fun they're having in Andy's backyard at Walt Disney World Resort. Yes!!! I'm super excited about this new land. I saw a YouTube video of the Slinky Dog coaster and it just looks fun. And I'm really hoping Woody's Lunch Box fills that food void at HS. We probably will check it out in September of October.